New Horizons took this image on July 7, 2015, at a distance of just under 5 million miles (8 million kilometers) from Pluto. A large heart-shaped bright area appears at right. NASA's New Horizons spacecraft is less than a week away from the first-ever flyby of frigid and faraway Pluto. On July 14, New Horizons will zoom within just 7,800 miles (12,500 kilometers) of Pluto, snapping history's first up-close photos of the dwarf planet's mysterious surface. A photo taken by New Horizons on July 7 shows a 1,200-mile-wide (2,000 kilometers) feature that looks like a heart, as well as an 1,860-mile-w (3,000 km) dark patch that mission scientists have dubbed "the whale." The whale also shows up in a color map the New Horizons team has constructed based on images gathered by the probe between June 27 and July 3. This view also shows the whale's tail brushing up against a 200-mile-wide (320 km) "doughnut" that could be a crater or volcanic feature, researchers said. This map of Pluto was created from images taken from June 27 – July 3, 2015, by the Long Range Reconnaissance Imager (LORRI) on New Horizons spacecraft, incorporating lower-resolution color data from the spacecraft’s Ralph instrument. Photos taken by New Horizons on July 1 and July 3 highlight the mysterious large dark patches that lie near Pluto's equator and make it clear that the dwarf planet's surface is complex and variable. The image shows Pluto in color, obtained by New Horizons spacecraft on July 3, 2015, using color data gathered earlier. "Intriguing details are beginning to emerge in the bright material north of the dark region, in particular a series of bright and dark patches that are conspicuous just below the center of the disk in the right image," NASA officials wrote in an image description on July 6, the day the photos were released. Thee high-resolution views of Pluto were by NASA’s New Horizons spacecraft, obtained between July 1 and 3, 2015. Photos taken by New Horizons between June 23 and June 29 — when the spacecraft was 15 million to 11 million miles (24 million to 18 million kilometers) from Pluto — show some surface features on the beige dwarf planet and grayish Charon, its largest moon. "It’s a bit unusual to see so much surface detail at this distance," New Horizons co-investigator William McKinnon, of Washington University in Saint Louis, said in a statement. "What’s especially noteworthy is the level of detail in both bodies. It’s certainly whetting our appetite for what’s to come." The image below is a still taken from a six-frame movie NASA released on July 3. This color view of Pluto and its largest moon, Charon, was captured by NASA's approaching New Horizons spacecraft. The image is a still from a six-frame movie composed of photos New Horizons took between June 23 and June 29, 2015. And photos of Pluto taken on July 1 from a distance of 10 million miles (16 million km) are even more enticing, showing patches of dark and bright terrain on the dwarf planet's surface. In the inset image below, features as small as 100 miles (160 km) across are visible, NASA officials said. Pluto and its largest moon Charon, as photographed by New Horizons on July 1, 2015. 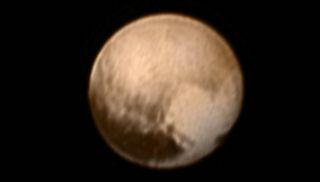 The inset shows Pluto enlarged; features as small as 100 miles (160 kilometers) across are visible. New Horizons' first maps of Pluto, made using the probe's LORRI and RALPH instruments, show that the dwarf planet is reddish-brown, somewhat similar in color to Mars. But while Mars' hue comes from iron oxide (rust), Pluto's reddish tinge is probably caused by hydrocarbons formed when solar radiation and fast-moving cosmic rays interact with methane on the dwarf planet's surface and in its atmosphere, mission team members said. "Pluto's reddish color has been known for decades, but New Horizons is now allowing us to correlate the color of different places on the surface with their geology and soon, with their compositions," New Horizons principal investigator Alan Stern, of the Southwest Research Institute in Boulder, Colorado, said in a statement. "This will make it possible to build sophisticated computer models to understand how Pluto has evolved to its current appearance." New Horizons' first maps of Pluto, created using data from the probe’s LORRI (left) and RALPH (right) instruments, show that the dwarf planet is reddish-brown. On July 1, NASA released images showing Pluto and its largest moon, Charon, in true color. The photos reveal a series of evenly spaced dark splotches, each of them about 300 miles (480 kilometers) wide, near Pluto's equator on one side of the dwarf planet. New Horizons scientists don't know what to make of the features yet. "It’s a real puzzle — we don’t know what the spots are, and we can’t wait to find out," New Horizons principal investigator Alan Stern, of the Southwest Research Institute in Boulder, Colorado, said in a statement. "Also puzzling is the longstanding and dramatic difference in the colors and appearance of Pluto compared to its darker and grayer moon Charon." New color images from NASA’s New Horizons spacecraft show two very different faces of Pluto, one with a series of mysterious evenly spaced dark spots along the equator.